I have been absent for far too long. In fact, I've typed up recipe posts for several other recipes and the like, but my camera cord has been MIA. Whoops! So, my upcoming posts all have pictures from my phone. Better than nothing? I hope so, because I've definitely missed my frequent blog posts and conversations with you! The title of this recipes comes from Rachael, and a text I got from her after I made these. The original title was "Shrimp Salad on Cucumber," which is not the best. When I told John about Rachael's title suggestion he got SO excited (go Moyer!). He thought it was way better than the original. Anyhoo, this is a super easy recipe to throw together, plus the "shrimp salad" portion involves NO mayo - how great is that?! It was the perfect thing to throw together before my girlfriends arrived for our monthly "girls dinner." Everyone gobbled this down, and it was so easy (and tasty!) that I will definitely be making it again soon. Oh, and did I mention that it's healthy? Well, it is! Enjoy! *Combine shrimp, celery, onion, yogurt, Laughing Cow Swiss Cheese, and season to taste with salt and pepper. 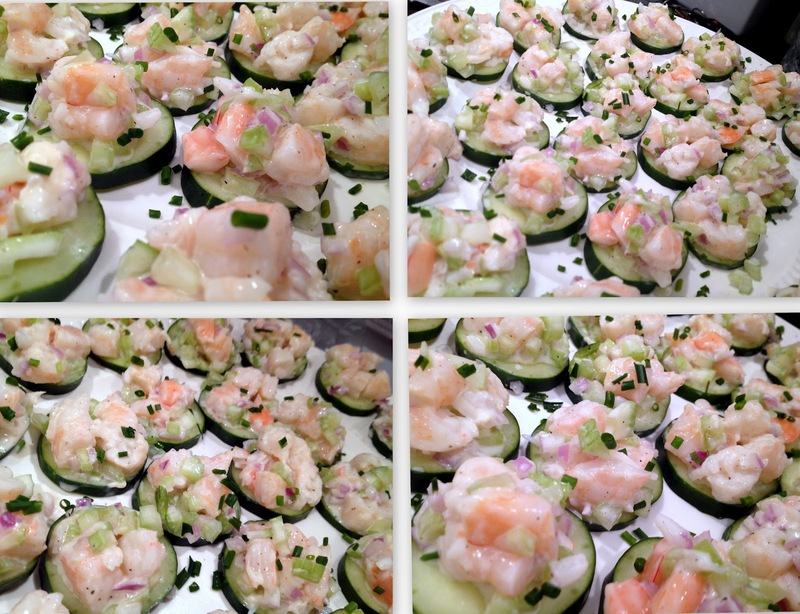 *Arrange cucumbers on a platter and top each cucumber with a heaping tablespoon of shrimp salad. Top with chives for garnish. This looks delicious! I will be trying this soon! I love shrimp and cucumber! Thanks! It really turned out great - way better than I even anticipated!